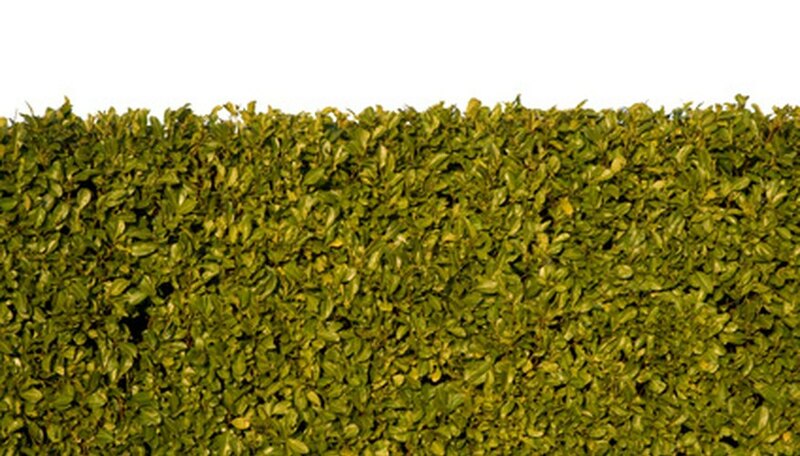 Hedges can serve many purposes in the landscape, including acting as a privacy fence, windscreen, property boundary or visual backdrop to other, more colorful plantings. In small yards or where a limited amount of space is present between buildings, a narrow hedge may be required. Appropriate plant selection will allow you to plant and maintain the slimmest hedges, while still providing all the landscape benefits of an attractive hedge. Rocky Mountain juniper (Juniperus scopulorum) is an evergreen shrub which grows in well-drained, dry soils throughout the central and southern United States. While many juniper varieties are suitable for dense, attractive hedge plantings, the Rocky Mountain juniper is the slimmest form of the plant. According to the University of Tennessee Agricultural Extension Service, the Rocky Mountain juniper can grow 30 to 40 feet tall, but its slow-growing, pyramid-shaped form can be kept to a mere 3 feet in diameter with regular pruning. This variety also has a lovely bluish tone to its foliage and bears blue-gray berries. The tallhedge buckthorn (Rhamnus frangula 'Columnaris') is one of the best hedge plants for screening, according to the Purdue University Cooperative Extension Service. Tallhedge buckthorn grows in most of the United States from the far north to the central south, in nearly all soil conditions. It can be trimmed to remain at less that 5 feet in width yet retain its dense screening habit through the spring and summer with deep green glossy leaves and bright red berries. In autumn its leaves turn bright yellow then drop, but leave a dense mass of twigs which continue to serve as a screen and windbreak in winter and resist snowfall damage.